National Cybersecurity Center (NCSC) which is currently a part of NCA. 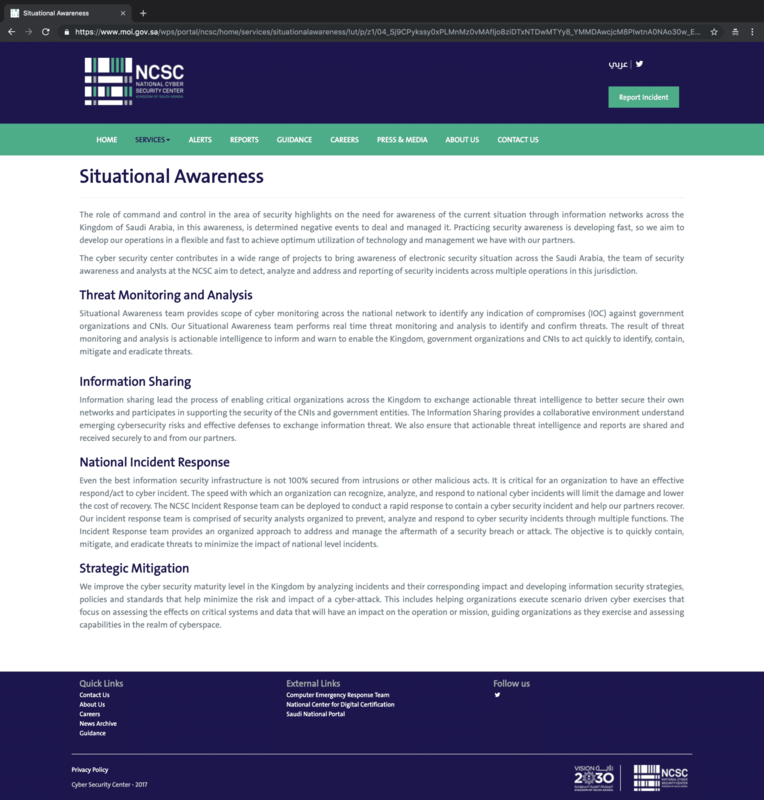 National Cybersecurity Center (NCSC) publishes reports on national cyber threats. 1. Travel and tourism instructions. How to get the best WiFi service in your house. Parents tips for a kids-friendly internet. Children tips for a safe internet. User right to suspend services. User right to request cancellation of services. Study plan for Middle school shows that taking one computer and information technology course “الحاسب الآلي” per year is compulsory to pass each grade. Study plan for High school shows that taking two computer and information technology courses “الحاسب الآلي” per year is compulsory to pass each grade. 1. Computer and Information technology course book for the first year of middle school, Second semester. 2. Computer and Information technology course book for the Second year of middle school, first semester. 3. Computer and Information technology course book for the first year of high school. elements of information security; confidentiality, safety and availability. Ethreats; Spoofing, Eavesdropping, and viruses. Encryption types; Symmetric cryptography and Asymmetric cryptography. WiFi encryption types: WEP, WPA and WPA2. Firewall, https, digital signature and digital certificates. 2-5 instructions for information protection. Saudi Computer Society has a group for information security. It is mentioned as the second point in the last section. Saudi Arabia is a member of OIC-CERT. Saudi Arabia is also a member of GCC-CERT and Mnemo-CERT. Government organizations mentioned in the scope includes all public sector organizations and companies, not only those operating or hosting CNIs. 3- Define critical national infrastructure assets and related entities, and identify priority sectors for cybersecurity protection efforts;"
Damage or loss of lives. Impact on services provided to a large number of users (more than 5% of the population). Thus, if an entity has a system that match one or more of these criteria, it is considered an operator of essential services. 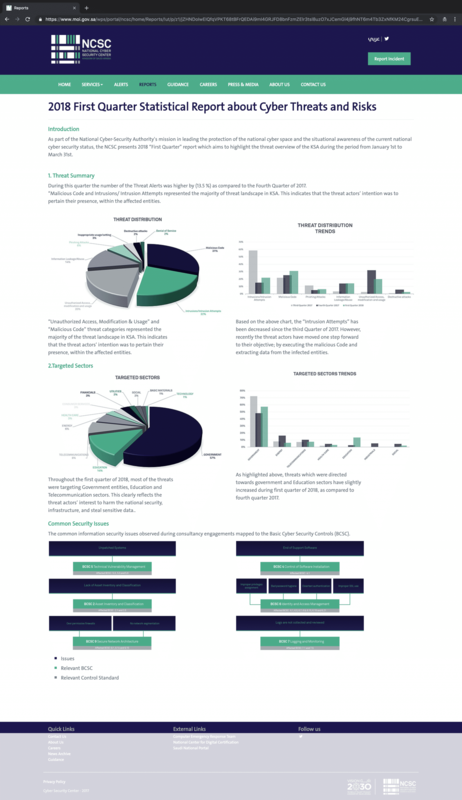 A summary of the Main and sub components of critical systems’ cybersecurity controls that are explained in detail throughout the document, Page 13. “NCA evaluates organizations’ compliance with the ECC through multiple means such as self-assessments by the organizations, periodic reports of the compliance tool or on-site audit visits. cybersecurity function in the organization to assess the compliance with the cybersecurity controls in the organization. 1-8-2 Cybersecurity audits and reviews must be conducted by independent parties outside the cybersecurity function (e.g., Internal Audit function) to assess the compliance with the cybersecurity controls in the organization. Audits and reviews must be conducted independently, while ensuring that this does not result in a conflict of interest, as per the Generally Accepted Auditing Standards (GAAS), and related laws and regulations. b- Full name with at least four names provided (first name, father’s name, grandfather’s name, last name or fame name). i- preservation number, entity and date. Additionally, NCA is currently working to enhance the unique persistent identifier to all citizens, residents, and legal entities. Meras is a government program launched as part of Saudi Vision 2030, which provides all government and private sector services that is needed to start your business in one day. Meras provides a high quality integrated services through an online and physical One-Stop-Shop centers. GSN Network: A Communications Network for e-Government Transactions established by YESSER Program. 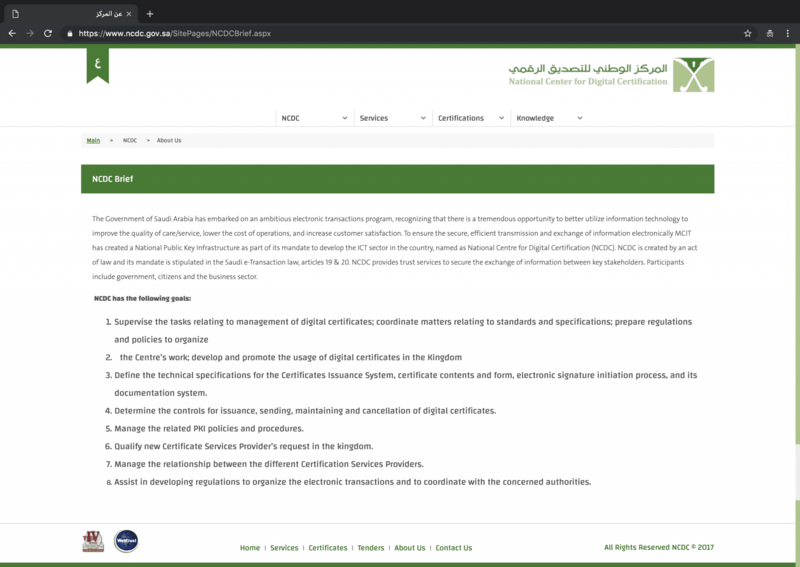 The National Center for Digital Certification (NCDC) provides trust services to secure the exchange of information between key stakeholders. Participants include government, citizens and the business sector. On February 2019, NCA conducted a simulation exercise to respond to national cyber crisis event, with the participation of a number of international expertise, government and vital agencies, and the presence of a number of officials and national specialists in cybersecurity. Saudi Arabia has participated in the 4th Cyberdrill for Arab region in Tunisia, in 2016. Saudi Arabia is a member of the Interpol and has a National Central Bureau in Riyadh, the capital city of Saudi Arabia.